IRS Letter 2201A has been generally deprecated in in favor of the new Form 2202. Either is used to notify you of an audit. 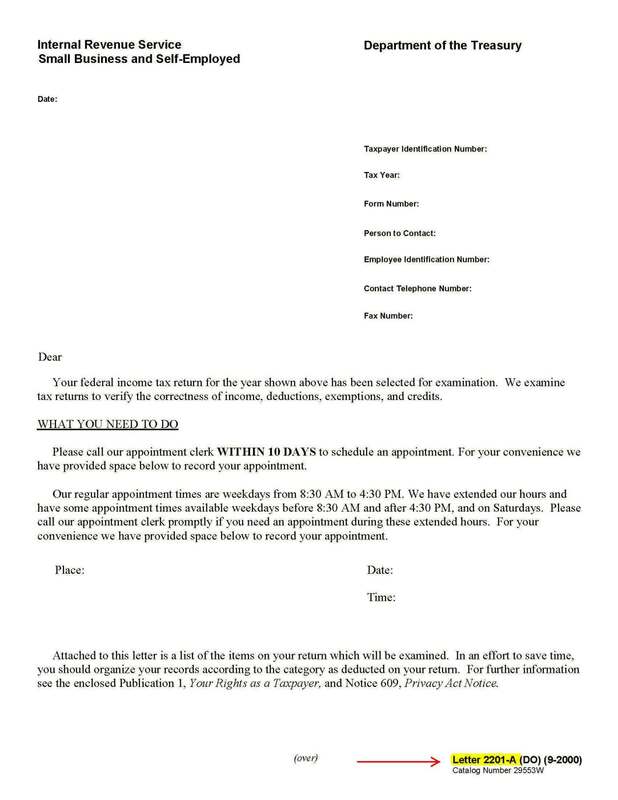 Page 3 of this Letter has boxes for the IRS to check when they are requesting various items. See if any of these boxes are checked. The IRS might also use Form 4564 or Form 886A to ask you questions. The Form 2201-A is often used for office audits. You will be required to respond to the items listed on the 3rd page of the Letter 2201A (or the Forms 4564 or 886A). Call the Agent or the IRS at 1-800-829-1040 & request your "Wage & Income Transcripts". These documents contain all 3rd party records sent to the IRS on you. Your spouse (& children, perhaps) should order their transcripts as well. You can verify the entries on your return. Deduction Issues: The IRS will often reject insufficient or poorly organized records & offer little explanation for why or how you can repair them. The IRS is not allowed to give you legal advice or tell you how to arrange your records. You must give the IRS evidence of titles, insurance, bank statements, purchase documents, vital records, court records, etc., not just a pile of receipts or even an accounting software program. And, the evidence must be arranged in exactly the manner required. Don't let them intimidate you. Keep a direct course proving your case, be extremely thorough with your documents. The first step is to determine which Schedule of your return is being questioned. If the issues involve your Schedule C, Form 2106 or Schedule E please follow the TaxHelp Business Edition Prep Steps. If the IRS questions are related to your Form 1040, the Schedule A or any other issue, please follow the TaxHelp Individual Edition Prep Steps. For all other issues, please prepare your case by reviewing the TaxHelp Audit Products before you respond to the IRS! If no boxes are checked on page 3 of the Letter 2201A, the IRS will send you a Form 4564 or a Form 886A to ask questions of you. Please gather the form you received and compare it to the Form 4564 or Form 886A. Follow the TaxHelp Prep Steps to victory! !